Trying to find anything original on the Nintendo Switch is not a challenge, thanks in large part to the Nindie section of their eShop. I’m always trying to find a hidden indie gem, and one such title that intrigued me was a cute little platformer featuring twin-stick shooting mechanics from developer ByteRockers’ Games called Gelly Break. While the gameplay mechanics are sound, was this the type of co-op platforming experience that could stand tall amongst the plethora of indie releases? Gelly Break was designed from the ground up for the Switch and took advantage of several of the console’s unique features. 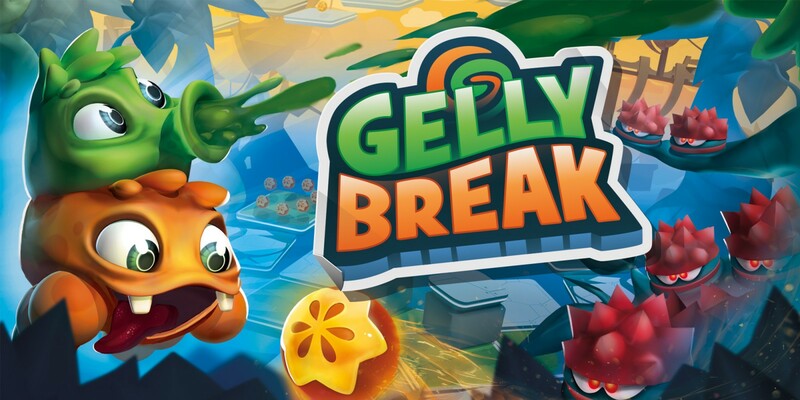 At its core, Gelly Break is a cooperative title that has each player controlling a blobby protagonist. I appreciated the arcade-like nature of the game with it being very easy to drop-in and drop-out with friends, and it’s easy enough to swap between single-player and multiplayer modes. When playing by yourself you control both blobs by yourself and while this is not the optimal way to play, it doesn’t take away from the experience but provides a different set of challenges. The cutesy art style might make Gelly Break look like an easy title, but this is definitely a challenge, especially in the later stages. As with most games with solid design, the mechanics are introduced at a reasonable pace, letting you get the hang of platforming and shooting. Throughout each level, there are little orange fruits that you can collect which grant your blobs an extra life when you collect 100. There are also special containers that are oftentimes hidden off the beaten path that can be used to unlock harder level variations, but these require a bit of mastery in order to acquire. Your main goal is to make it to the end of a series of levels and there are a few different ways to achieve this task. A neat gameplay mechanic is the ability to jump on top of the other gelly’s head and this allows the top belly to fire while the bottom one is moving. Combining their powers allows you to swap positions at any time in single-player, and as long as both players are holding the swap button simultaneously during multiplayer. Teamwork is of utmost importance when swapping colors and this is why a nifty icon will show up over a character’s head when the other player wants to switch with you. Both of the blobs can walk on semi-translucent platforms of their own color, but the other player will fall through it. You will have to solve many puzzles by swapping mid-jump from the color of the platform to ensure the bottom blob is the same color or you will fall through. You’ll also run across glass containers that may contain health pickups or bonus items, and these can be shattered by swapping three times in rapid succession. Doing so means whoever was on top will end up on the bottom, so these glass containers give both players a chance to practice the maneuver frequently. This mechanic is important to master as some of the enemies in the later stages turn into glass when shot and have to be finished off by swapping. Working as a team is essential, and like many co-op games frustration may occur, but shouldn’t be the norm. Fortunately, Gelly Break only has a few instances of frustration, but for the most part, the controls were easy to comprehend and learn. When the platforming get tough, the mechanics may become tough to truly master, but I still was able to figure out what I was doing wrong, and soon enough cruising through the levels. Some of the 3D camera angles made it hard to judge where I would land and lead to some unnecessary falls. Thankfully, the penalty is not too severe for falling with you only losing a little health rather than a life. A highlight of Gelly Break were the boss battles with each one having a unique aesthetic and different way to defeat them. Finding all the containers will allow you to take on harder variants of the base bosses which ratchet up the difficulty if you want more of a challenge. There are six worlds to go through and took between roughly three to four hours to complete. With finding all the optional bonus levels, there’s enough content here to provide for a fun experience but not much else. Overall Gelly Break is a unique twin-stick shooting platformer that features some puzzle mechanics and is definitely worth recommending as long as you have a friend. I enjoyed my time with single-player too, but the fun factor drops a few pegs due to some frustrating elements to the gameplay. This was meant to be beatable by a parent playing with their child, and from experience of playing with my oldest, he quickly grew bored which may be a problem if you go in with the wrong mindset. Otherwise, Gelly Break provides a satisfying experience for those looking for a platformer in the Yooka-Laylee mold.